S. Dakota Indian Foster Care 3: Filthy Lucre : NPR Public Editor The NPR investigation into foster care for Native American children in South Dakota sought to follow the money but misused the way federal incentives and bonuses work. The series alleged that state social workers took the children from their families as a way to reap funds for the state, but it gave no proof for this charge, which does not stand up to scrutiny. The weaknesses were covered over with tendentious language and tone. 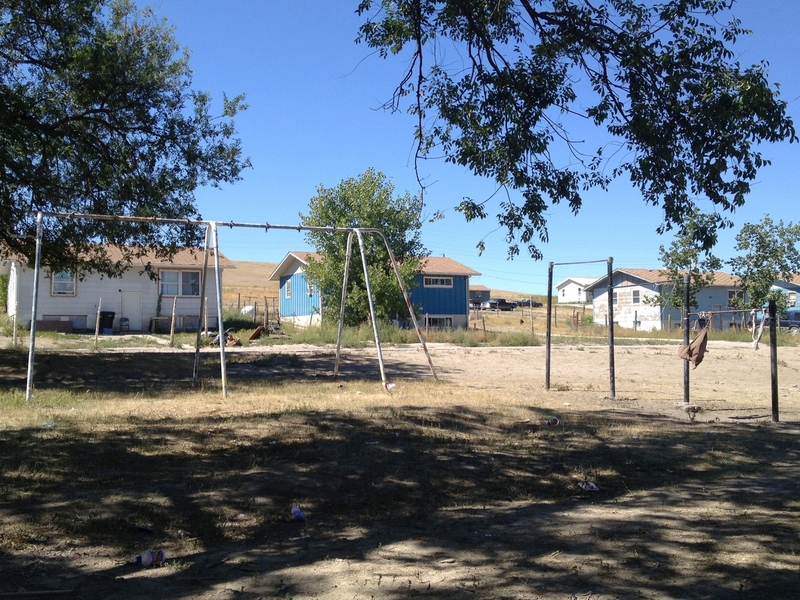 This Sept. 8, 2012, photo shows a playground on the Pine Ridge Indian Reservation in South Dakota. The reservation for years has attracted the eyes and ears of journalists and activists eager to tell the stories of the Oglala Sioux Tribe. Allegation: A financial interest to reap federal aid drives the taking of Native American children from their families and placing them in foster care. Follow the money. This is what investigations so often rightly do, and in the case of Indian foster care in South Dakota, the money is mostly federal aid. The allegation made by the NPR reporting team is that the state unnecessarily takes children from Indian families so as to collect federal funds. This uncovering of what amounts to evil state bureaucratic greed has never been reported before and, if true, provokes outrage. The allegation is unproven and much of the language and storytelling is unfair. The problem is that the allegation is unproven, and much of the language and storytelling used to make it are unfair. Let's look at how the charge is presented. On a superficial level, the wording can be seen as technically correct. On air, however, and online it comes off more as a chimera of wordplay that, added to the direct statements by Sullivan about financial motive, paint an unmistakable picture of wrongdoing. State officials say they're doing everything that they can to keep Native families together. But there's another powerful force at work: money. State officials say they're doing everything they can to keep native families together. Poverty, crime and alcoholism are all real problems on South Dakota's reservations and in the state's poorest areas. But, state records show there's another powerful force at work — money. The federal government sends the state thousands of dollars for every child it takes. Most social workers care deeply about the children they work with, and few would voluntarily take on more cases. But a close review of South Dakota's budget shows there's a financial incentive at work. Every time a state puts a child in foster care, the federal government sends money. Because South Dakota is poor, it sends lots of money — almost $100 million a year. A close review of South Dakota's budget shows there's a financial incentive for the department as a whole to remove more children. Every time a state puts a child in foster care, the federal government sends money. Because South Dakota is poor, it receives even more money than other states - almost a hundred million dollars a year. "Money" — filthy lucre, judging by the tone — is thus a driver to "remove more children." But the first hint of weakness in the argument is that added comparison to other states. The claim that South Dakota "receives even more money than other states" is wrong. In FY2010, the year the story mostly deals with, South Dakota was 48th among the states in Title IV-E funding, the central source of federal assistance for foster and related care and adoption for all children, including Indians, according to the United States Government Accountability Office and the Department of Health and Human Services. The state was followed only by Delaware and Wyoming. One could technically argue that the two represent "other states," but I have to believe that the reporters did not mean to be that disingenuous. South Dakota also didn't lead on a per capita basis. I didn't find a per capita ranking of all 50 states, but in the table below, I did my own calculations and looked at six other states with similarly small populations but most with relatively large numbers of Indians. South Dakota received less federal money than North Dakota and Alaska, the two states it is most often compared with on Indian and other matters. I also looked at California, the largest state by total population and the one that received the most federal funds for foster care. South Dakota received roughly a quarter of what California did on a per capita basis. Source: 2010 Census and the March 2012 GAO report, "Foster Care Program: Improved Processes Needed to Estimate Improper Payments and Evaluate Related Corrective Actions." Nor did South Dakota lead on federal funding per child in foster care. According to Kim Malsam-Rysdon, the head of South Dakota's Department of Social Services, South Dakota in 2010 received $11,344 per child, less than half the national average of $25,019. This is for a child of any race. The comparative error by itself does not undermine the money thesis. What does is the almost empty case that follows. Let's look at just the radio transcript. I do this in criticism as much as in convenience. The Web version should have differed substantially from the radio one, but didn't. We as listeners don't want a radio report to get bogged down in numbers and other details, but we do expect the Web version to be complete. The total lack of supporting documentation and data online was unacceptable. SULLIVAN: Most social workers care deeply about the children they work with, and few would voluntarily take on more cases. But a close view of South Dakota's budget shows there's a financial incentive at work. Every time a state puts a child in foster care, the federal government sends money. Because South Dakota is poor, it sends lots of money - almost $100 million a year. BILL NAPOLI: When that money came down the pike, it was huge. That's when we saw real influx of kids being taken out of families. Families were being disrupted because the money was there. SULLIVAN: Bill Napoli is a former state senator who served on the Appropriations Committee. He says there was little state lawmakers could do. This was federal money, and it went straight to Social Services. NAPOLI: I'm sure that they were trying to answer a public perception of a problem and then slowly, it grew to the point that they had so much power that no one - no one - could question what they were doing. Is that a recipe for a bureaucracy that's totally out of control? I would say so. SULLIVAN: Department officials Virgena Wieseler and Kim Malsam-Rysdon strongly disagree. They say money has never influenced their decisions to remove a child. WIESELER: The state doesn't financially benefit from kids being in care. WIESELER: The state is always paying some part of it. SULLIVAN: But, in general, the more children that the department has, the more money they may be getting from the federal government. WIESELER: It's still, you know, state general dollars that have to match all those federal dollars that come in. SULLIVAN: Except it's not exactly a match. According to federal records, last year, the federal government reimbursed the state for almost three-quarters of its foster care expenses. Then there's the bonus money. States get money if they move kids out of foster care and into adoption, about $4,000 a child. But if the child has special needs, they can get as much as $12,000. Well, a decade ago, South Dakota designated all Native American children special needs, so Native American children who are permanently removed from their homes are worth more financially to the state than other children. In 10 years, just this bonus program has brought South Dakota almost $1 million. MALSAM-RYSDON: The key to that funding, though, is that those dollars are to be used to support adoptive placements. SULLIVAN: The department's Kim Malsam-Rysdon. MALSAM-RYSDON: So the state does not gain monetarily from placing kids in adoption. SULLIVAN: Or does it? That money, and almost $100 million more, funnels into the state economy every year. The department employs 1,000 workers. It supports almost 700 foster families, who receive as much as $9,000 a year for per child; 1,400 families who receive thousands in adoption subsidies; and dozens of independent group homes that get millions of dollars in contracts to take care of children. Just ask former Governor Bill Janklow, who ran the state in the 1990s. How important was the money that was coming from the federal government to Social Services? BILL JANKLOW: Incredibly important. Look, we're a poor state. We're not a high-income state. We're like North Dakota without oil. We're like Nebraska without Omaha and Lincoln. We don't have factories opening here, hiring people at high-wage jobs. SULLIVAN: The federal government gave South Dakota at least $15,000 for Janice Howe's grandchildren while they were in foster care. South Dakota spent more than half of that money on administrative costs, according to federal records. But even now, as the money filters in, the federal government asks few questions about whether states are complying with the Indian Child Welfare Act. In fact, a 2005 government audit found at least 32 states are failing, in one way or another, to abide by it. GEORGE SHELDON: I think we've got to do better. And frankly, to the extent to which we can provide some leadership, I'd like to see us do that. SULLIVAN: George Sheldon is the man in Washington sending the money. He just took over the federal Administration of Children and Families, and says he wants to make changes. SHELDON: When you have a financing system that pays states based on the number of children in care, what's the incentive to keep kids out of care? So, after stating the money motive at the beginning of the passage, Sullivan fleshed out the thesis, but in a backhanded, prejudicial way. "They say money has never influenced their decisions to remove a child," she reports, and then allows the two state officials to deny this on-air. But without proof behind the charge, raising it is akin to the infamous example of asking a male politician when he stopped beating his wife. The denial is reported, but a doubt is left and the damage done. Here, too, there is no proof. And here, too, the harm is done. Seen close, Sullivan's case rests mostly on quotes by former state legislator Napoli, former governor Janklow and federal official Sheldon. Let's look at each. Napoli is referring to the 1990s, when the United States Congress passed two key bills. One established the Family Preservation and Family Support Services Program, which set up the Title IV-E funds for foster care. The other was the Adoption and Safe Families Act, which helps move foster children into adoption as soon as possible. The laws have to do with all Americans, not just Indians. The two laws sought to respond nationally to the crack cocaine epidemic, the eruption of AIDS and a growing number of jailed mothers — all bad enough, but made even worse by an economic recession. Both laws provided increased assistance to keep families together. But in what has been a historical swinging of the policy pendulum between maintaining families and protecting children from abuse and neglect, the bills put the emphasis on the latter. They were part of a trend reflected by an explosion in the number of children — of all races and ethnicities — being put into foster care. Between 1986 and 1995, their number shot up to nearly 500,000 from 280,000. This was a 76 percent increase, according to a legislative history of the child welfare system by the scrupulously independent Pew Charitable Trusts. Said Pew's report: "When States protested the added costs of protecting children in unsafe homes, Congress reacted by creating federal foster care funding. In this way, the federal government ensured States would not be disadvantaged financially by protecting children." South Dakota was no exception. I could not easily get South Dakota foster care numbers back to 1986, but between 1995 and 2002, as the national rate continued to grow at a fast clip, the average monthly number in South Dakota of all children in foster care, grew to 795 from 426, according to state-provided numbers. This was a growth rate of 86 percent — not too unlike the national rate. After 2002, the number in South Dakota trended slightly downwards. In other words, the growth in foster care in South Dakota was part of a national trend, as was the growth in federal funding, which responded to a need across the country. The sources have bureaucratic beefs but don't confirm the money thesis. Napoli says as much in his next quote. "I'm sure that they were trying to answer a public perception of a problem," he says. His statement is unclear as to where he stands concerning the policy pendulum, but it is acknowledgement of the messy trade-off between protecting families and protecting children, which the series largely ignores. More importantly, nowhere does he say that the state Department of Social Services is doing anything illegal or immoral. Indeed, his most explicit beef is bureaucratic. He says federal funding to the department "grew to the point that they had so much power that no one — no one — could question what they were doing. Is that a recipe for a bureaucracy that's totally out of control? I would say so." Nothing here, however, is damning. The department may be bureaucratically powerful — "out of control," as legislators are often want to say about the executive branch — but this is a far cry from saying that it is putting children into foster care so that it can collect federal funds. He never makes that charge. As might be expected, moreover, Malsam-Rysdon disagrees with Napoli's bureaucratic analysis. Malsam-Rysdon argued to me that her department does not have the power that Napoli claims, and that the state legislature has to approve the use of federal funds, not to mention approve and allocate the matching state funds. I don't know who is right, although I do have to believe that Malsam-Rysdon's department does not have total discretion over its budget. Regardless, her rejoinder should at least have been heard by us. The second offer of proof is the quotes by former Gov. Janklow. Sullivan asks him on-air: "How important was the money that was coming from the federal government to Social Services?" And he replies, "Incredibly important." The most he confirms is that federal money is important to a poor state like South Dakota. And? "When you have a financing system that pays states based on the number of children in care, what's the incentive to keep kids out of care?" Sheldon asks on-air. It's an interesting question. Sheldon is saying that there are no financial incentives to re-think foster care in general. This is part of the pendulum conundrum: keeping families intact versus protecting the children. But his statement proves nothing when it comes to malfeasance. Sheldon doesn't even make an accusation. But as in so much of the discussion over foster care, Sheldon does refer to "incentives," and this, it turns out, is critical. Confusion over just what incentives mean is at the heart of how the series goes astray on the money angle. The federal and state governments speak of federal funding as an "incentive," but the series miscommunicates the intended meaning. To the extent that federal funds help the state do its job, the money is indeed an incentive. But the same can be said of federal funds transferred to states for education, health care, police and myriad other state services aided by federal programs. By making it cheaper for states, the federal aid encourages the undertaking of these services. But this is not like a common incentive in the private sector. There is neither a sliding scale nor a bonus for the state if it meets or passes certain targets. To the contrary, if the state rounds up more than some minimum number of children it gets nothing extra from the federal government. Indeed, there is no profit for the state at all. Seen in private industry terms, the more the state puts Native children into foster care, the more it loses, not gains. This "loss" is in the ever-greater amount that the state itself has to pay for a greater number of children. To calculate the size of what the state pays, we have to look at federal reimbursement formulas. Sullivan reports in the segment above that the federal reimbursement is for "about three-quarters" of South Dakota's foster care expenses, meaning that the state pays about a quarter. Malsam-Rysdon, however, said that the state's contributions are significantly more, and she cited federal funding formulas and turned over budget summaries. In FY10, the year that is the focus of the story, she said the federal government contributed $30.5 million toward total expenses of $55.7 million for foster and related care for all children, not just Indians. Another $850,000 came from minor "other" sources such as a children's trust fund, leaving the state's contribution of $24.4 million, equal to nearly 44 percent. For FY11, she said that it was 42 percent. See chart 4.2 in Chapter 4. Think for a second: $100,000 a year for the state is hardly worth selling your soul for. Either of those percentages is a long way from the reported quarter. Malsam-Rysdon estimated that the proportional breakdown between federal and state contributions was roughly the same for Indian children. She insisted that there were no additional or hidden federal funds going through other departments. The reimbursement proportion is central to the financial charge, and yet the state's disagreement with the one quarter assertion was never reported. It should have been. More fundamentally, what is certain is that whatever the proportion is, the state pays something, as even the series acknowledges. Says Wieseler on-air, "the state is always paying some part of it." And the more children that the state puts into foster care, the greater the total is. This hardly makes the federal funds much of an "incentive" for the state to want to remove more children from their families. If the state does so, the federal funds do not lessen what the state pays in absolute dollars, do not lessen what it pays in relative dollars per child, and do not create a profit for the state. Some Native American advocates have seized on the NPR report and said that it proves at least that the state just somehow wants to bring extra money from outside into the economy and state coffers. But now the distance between crime and payoff is so great that the motive is even less credible. The state government and state taxpayers have to pay more by paying their share, no matter how you cut it. To their credit, Sullivan and producer Amy Walters do air Wieseler, head of Child Protection Services, saying unequivocally, "The state doesn't financially benefit from kids being in care." Yet, Sullivan immediately dismisses the denial by returning to her loaded use of incentives and saying, "But, in general, the more children that the department has, the more money they may be getting from the federal government." This is technically true but totally misleading. The use of "may" as a hedging word is no defense here. The illogic gets lost in the semantics of 'incentive', 'match' and 'bonus'. Also misleading is the investigation's use of the terms "match" and "bonus." But here the miscommunication is doubly unfair, because it is done with a tendentious tone. The tone might be acceptable if there were proof to support it, but there isn't. After Malsam-Rysdon notes on-air, for example, that the state has to "match" the federal funds, Sullivan dismisses her statement by saying that it is "not exactly a match." True, it is not a one-for-one match, as Sullivan appears to mean here. But in the lexicon of federal and charitable fund-giving, a "match" can be any percentage. The state never claims it is one-for-one, and I suspect that most federal-state matches aren't. The on-air dismissal is thus sarcastic rather than informative. Similarly, the government refers to extra federal funding for special needs children as a "bonus." As Sullivan reports above: "Well, a decade ago, South Dakota designated all Native American children special needs, so Native American children who are permanently removed from their homes are worth more financially to the state than other children. In 10 years, just this bonus program has brought South Dakota almost $1 million." The tone is set by the opening, "Well,..." The word verbally raises a doubting eyebrow, a favorite set-up for television sit-coms. What follows, however, isn't comical. Indian children are described as "worth more financially to the state than other children." This leaves little question as to the story's implication: The state considers these Native children as mere chattel for making money. Without offering any supporting evidence, the characterization is egregiously unfair. Also unfair is the suggestion that the state somehow wrongly manipulated to achieve the special needs designation. The series wants to have it both ways, asserting in some parts that Native children do indeed have special needs for cultural reasons but then, in this part, casting aspersions on the validity of the designation. In sum, the special needs "bonus," the federal "match" and the general foster care "incentive" are misrepresented in the story and do not constitute much of a financial motive for the state to take Native children from their families unnecessarily and put them into foster care. There are no reported targets, quotas or orders to get more children and thus more money. This is true whether you hear the motive allegation as one of seeking profit or of bureaucratic inertia. This latter is a sophisticated organization analysis based on the way bureaucracies in any organization — corporate, government or non-profit — tend to do whatever they can to justify their continued existence and budget. Or, more benignly, they just keep doing what they do, as if they were on auto-pilot. In the case of the financial angle in the South Dakota series, this would mean that officials and social workers in the Department of Social Services act in ways that keep the federal money flowing, either intentionally or unintentionally. The organizational analysis is not explicitly made in the series. It can be defensibly argued, however, that it is implicit in the script. No matter. We still come back to this more important point: No proof is actually presented that the state is taking Native American children from their families as a way to collect federal funds, whether intentional or unintentional. The reporters present no whistleblower, no documents, no smoking gun to back the financial allegation. The only way to get federal money is to take children, and nothing in the series shows that state officials set targets or quotas to maintain or increase the number of children taken, or issue orders just to round up a few more. The reporters came up with no specific bureaucratic practices to criticize. These specifics that would make the case were not even discussed. Without any such proof, it is thus, to me, not enough to say that the series was merely raising and exploring questions about the role of federal aid. That may have been the intention of some of the journalists working on the series. The editors do acknowledge that, at the very least, the script could have been clearer about the semantic confusion created by the funding terminology. But what comes across in the final product is so loaded, and with enough specific statements about the money motive, that we as listeners are left with no doubt about the abuse of Indian children by the state. Or in this case: whether state social workers were so cruel as to forcibly take Indian children from their families as a way to collect money for the state, if only because the money was there. Lacking proof and necessary context, the result is a report beneath NPR's standards.